Can you even define the Swamp? Candidate Donald J. Trump often spoke on the campaign trail about draining the swamp. As President-Elect, and later as President, Trump found himself surrounded by many of the Obama administration office holdover's and his own appointees who were discovered to be creatures of the swamp. This administration has been in office for almost 500 days and still thanks to the tactics of Senate Democrats, the Trump presidency still has many officials who require Senate approval being denied a vote which is required before they can assume their positions. As of January 2018, the Senate, where the Democratic minority has held up many nominees, had only confirmed 241 Trump nominees, while another 136 nominations were pending. The major old-line news media continues to attempt to justify the Mueller investigation of Russian/Trump tampering with the 2016 election but to date there is not one shred of evidence linking the Trump campaign with the narrative. Of course, the Department of Justice, FBI and other security agencies continue to slow walk the production of documents which various Congressional committees with Constitutional oversight authority have demanded. The code name ‘Crossfire Hurricane’ likely refers to Christopher Steele and helps explain Stefan Halper’s job: to get Trump campaign figures to ‘corroborate’ the dossier. Whether it began on July 30, 2016 or earlier is murky. Still only a very small group of top-level FBI personnel were privy to the operation. We know that the so-called dossier was paid for by the Clinton campaign thru its cut-outs and that Bruce Ohr's wife worked for Fusion GPS. The British ex-MI5 member Steele was an FBI informant and is credited with creating the dossier. To date, much, if not all, of the dossier has been debunked. Still the dossier served as part, if not the major part, of the FISA application which was used to initiate electronic surveillance on Carter Page, a low-level member of the Trump foreign policy ad-hoc group of volunteers. Working with British intelligence, the electronic intercepts failed to find evidence of collusion between the Trump campaign and Russia. More importantly, collusion is not a crime! At this moment, the only thing that Mueller has is indictments and guilty pleas for process crimes. In the Manafort case, Mueller has violated the statute of limitations to pressure Manafort to plead guilty or flip on Trump. In the Flynn case, there may very well be a reversal of the guilty plea as exculpatory evidence was not given to Flynn's defense lawyers. Some Constitutional lawyers believe that the whole Mueller investigation is unconstitutional as the charging document cites no crime as required by the Constitution and the procedures of the Department of Justice. Moreover, the revision to the original charging document for the Mueller independent counsel continues to hide behind the veil of "national security." White-wash the problem with Hillary Clinton's private e-mail servers and her health issues. Dig up dirt on any Republican candidate prior to the Republican convention. Intensify dirty-trick efforts on the Republican nominee after the convention. If Hillary Clinton failed to win the election, develop ways to frustrate the incoming President and to delay the Senate confirmation of any new administration nominees. It is obvious from what has been now discovered that there were many factions within the Obama administration that were involved in attempting to circumvent the results of the electoral college in the 2016 election. So many players, so many narratives that even the investigators get confused. Moreover, the delays in getting data released is often due to trying to hide the revelations in the "midst of Friday night dumps and the public's short attention span." 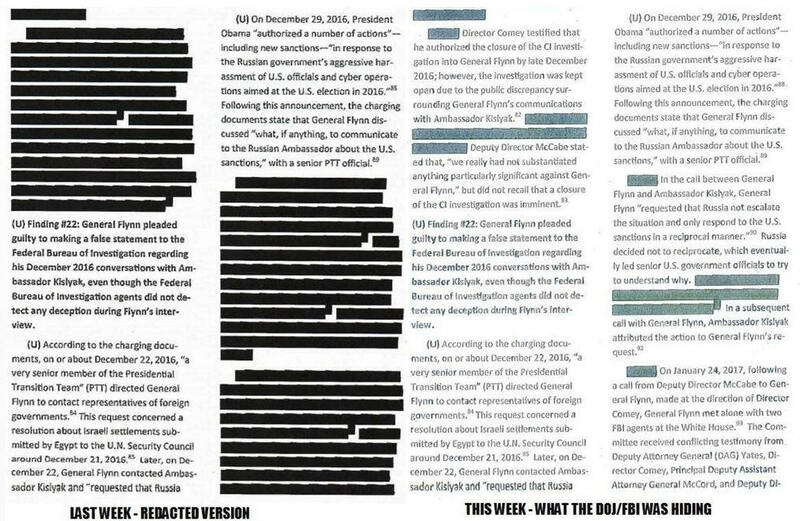 Redactions and Revisions in the name of "National Security"
What a joke! The following is an example of the FBI and the Department of Justice redactions in the name of "don't embarrass the players" or CYA! Can you identify anything that even loosely borders on "national security." According to the Constitution, Congress has oversight of the Executive Branch of government. Hence, its requests for information and documents are lawful. However, as we have seen multiple times over various administrations, the Executive Branch often slow-walks or even ignores these requests which could create a Constitutional Crisis if push comes to shove. Congress has the power of the purse and the subpoena to enforce its requests. However, in most cases, it is only an empty threat and often ignored by various agencies. Many government bureaucrats consider themselves permanent fixtures and entitled to draw a substantial pension. Civil Service rules have made it difficult to remove from office individuals who refuse to recognize Congressional oversight requests. As a result, President Trump has discovered that the swamp is indeed difficult to drain. What really frightens both Democrats and Republicans. In the last week, we have seen Trey Gowdy and Paul Ryan both break ranks with the Trump administrations views regarding the various ongoing investigations. Could it be that the Clinton investigation could as well as the Trump/Russian collusion investigation lead directly to the Obama White-House? What would be the implication of indicting a former U.S. President? With a seriously divided electorate, the implications are fraught with danger. Perhaps, politicians are willing to destroy the U.S. by having a two-tiered justice system. After all, they still want to drain the swamp!